This was a sweet morning dedicated to my sister, a delicious pancake recipe, and the passing of some styling tips onto that beautiful gal. 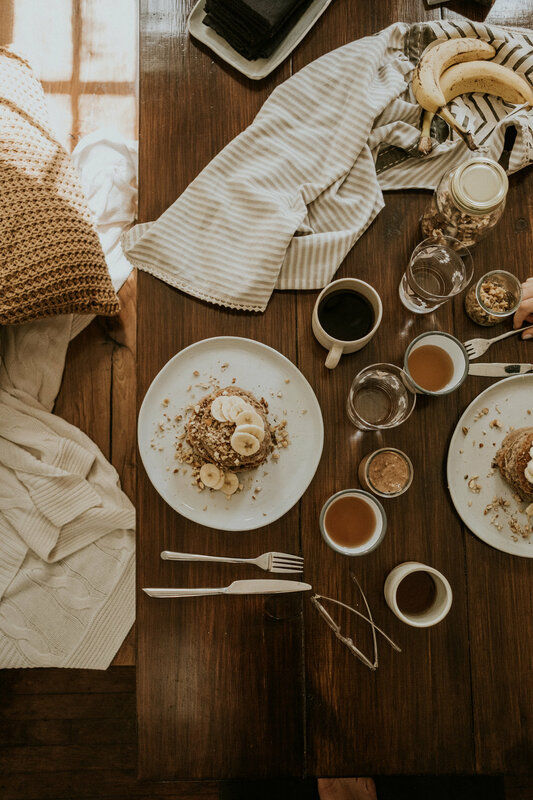 To practice some tablescape styling that morning, we started first with our subject: a killer recipe. If cooking, baking and plating is up your alley (or that of a dear friend/family member), then I find food to be one of the best, easiest and most fun things to style. And I would recommend giving it a go! My sister is a super talented baker - so naturally - breakfast was our perfect place to start. 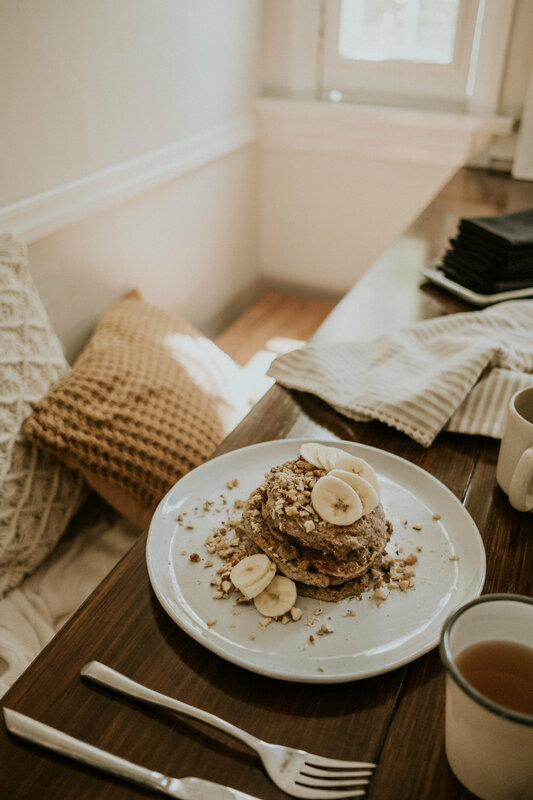 We browsed Minimalist Baker a bit (my favorite food blogger these days), and landed on this incredible Vegan GF Banana Walnut Pancake recipe with almond butter and a variety of nut toppings. After making it and and plating it, we got to work! 1. Focus on a variety of texture when you’re arranging your tablescape. Texture on the plate, texture in surfaces, texture texture texture. With all things, balance is key, but the more variety you have going on, usually the more potential there is for depth, detail and interest within your photo. 2. Have collected odds and ends on hand! With food or any other kinds of styling - the more items, cups, spoons, plates, containers, etc. you have on hand, the more options you’ll have to pull from when you’re working. With food, I like to keep a solid set of neutral dish-ware that I can count on, and then collect all the other odds and ends from antique stores and thrift stores along the way in order to keep things unique! 3. And if you don’t have a large collection of those things built up already - use what you have on hand in the meantime! Leftover ingredients (bananas, nuts, almond butter, glasses of water), blankets, pillows, sprigs of foliage from outside - all lend well to spontaneous styling! 4. Pick a color scheme and stick to it! Usually either warm or cold are the most reliable routes to choose from. For this shoot, we went with the warm gold/brown tones and made sure that the food and props matched with that vision right from the get-go! Even our clothing matched the color scheme just in-case we needed to hop in one of the photos! 5. Keep straights lines (like the table edge, bench and corner of the wall) parallel to the frame of the photograph. It balances things out and keeps the composition clean! 6. Practice, practice, practice. And then practice again! Styling takes time - in your skills and with your props. It all takes time and it can be so fun to just experiment and enjoy the process. Was this helpful to you?! Let me know below and I’ll be sure to boost the informational posts on this page if stuff like this is your jam!